The Diversity Game: Changing the Cybersecurity Workforce Landscape, September 18-19, 2018 in Atlanta, GA. The International Consortium of Minority Cybersecurity Professionals (ICMCP) today opened the Call for Speakers for their Third Annual National Conference of minority cybersecurity professionals. 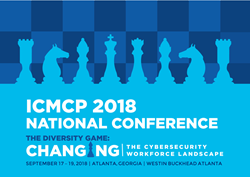 ICMCP is looking for energetic and knowledgeable Cybersecurity professionals and industry executives to participate in its annual national conference, and address attendees on a range of topics specifically devoted to “The Diversity Game: Changing the Cybersecurity Workforce Landscape,” September 17-19, 2018 at the Westin Buckhead hotel in Atlanta, Georgia. Call for Speakers is Open! Learn more at https://conference.icmcp.org/call-for-speakers.html. Founded in 2014, the ICMCP is a 501(c)(3) non-profit organization created with the objective to increase the number of students, practitioner and professionals from underrepresented groups in the field of Cybersecurity through educational/technical scholarships, mentoring & networking opportunities, career advancement & professional development, and innovative outreach programs. Our theme for the 2018 conference is, “The Diversity Game: Changing the Cybersecurity Workforce Landscape,” with focus areas/tracks in Industry Engagement, Career Advancement & Professional Development, and the C-suite. Please read full details regarding our sessions at: https://conference.icmcp.org/agenda.html. Submissions must be submitted electronically via the mailto:online submission form. All submissions must be received by March 26, 2018 to be considered. Submissions received after the deadline will be considered on a case-by-case basis. Accepted speakers will be given one complimentary pass to attend the national conference. Only one discount per presentation will be offered. For more information on the National Conference please visit, http://conference.icmcp.org. The International Consortium of Minority Cybersecurity Professionals (ICMCP) is a 501(c)(3) non-profit organization. It began official operations in September 2014 and is organized exclusively for charitable purposes, to provide members with educational/technical scholarships, mentoring opportunities, professional development and networking opportunities. For more information or to become a sponsor, please visit https://icmcp.org, follow @ICMCP_ORG on Twitter or visit the ICMCP LinkedIn page.